The image above is not just an old, slightly rusty cheese grater. It is a an image of childhood memories spent in the kitchen with my mother and sister. The handle is no longer a vibrant red, the paint worn away by years of use. There were no food processors in home kitchens when I was a child. Any and all grating was done by hand, often by children such as myself, while our mothers did the heavy lifting on the stove. She would sit me on a high kitchen stool with chunks of cheddar cheese, destined to be an ingredient in the macaroni and cheese that often graced the dinner table. I would put a chunk at a time into that little grater, and turn that handle with all the might I had! Sometimes I would grab a bit of the finely grated cheese, popping it into my mouth when my mother was not looking. But, as we all know, mothers have eyes in the back of their heads, and I was often scolded about eating the cheese meant for the casserole. This being the 1960’s, Carrot and Raisin Salad was all the rage. Shredded carrots, plump raisins and Miracle Whip Salad Dressing mixed together into a crunchy and sweet melange. That salad was a family favorite, and we had it fairly often. So there I would be, sitting on the tall kitchen stool, grating chunks of carrots for the salad. And getting scolded for eating what I was grating. This week I turn 50 years old, but those memories are so precious and fresh in my mind. I learned my love of food and cooking in the kitchen with family. An oft told tale of my mothers was about a loaf of bread. We were making homemade bread, and my sister and I had the task of kneading the dough along with our mother. We worked that dough, kneading as hard as we could. Now, being a small child, somehow my dough got away from me and plopped onto the floor, a little cloud of flour rising into the air. I quickly scooped that dough up, unsure what to do. Mom told me to brush it off and keep kneading. So I did. And my little loaf was the best one of all. My mother laughed about that dropped loaf for the rest of her life, always telling everyone how good that bread was. Now it’s time for me to start making memories with my daughter. She likes to be in the kitchen with me, already cracking her own eggs for breakfast. I have a new cheese grater now, which was sent to me to try out. This new Zyliss Rotary Cheese Grater is sleek and shiny. There are two rotary barrels, for grating fine or course. My favorite thing about the grater is that the handle folds in for easier storage. If your utensil drawers are anything like mine, space saving is a necessity. This cheese grater is worthy of replacing my antique model, though I will never part with it. As I become an antique myself, I have learned to appreciate them! I won’t make my daughter grate all the cheese needed for my Macaroni and Cheese, but I will be setting her up on a tall kitchen stool in the same kitchen I grew up in. Maybe I’ll develop a new recipe for Carrot and Raisin Salad, without the Miracle Whip though. Although I received this product at no cost, all opinions are strictly my own. You are so right Greg. I just taught a kids cooking class today, and they had so much fun. As did I. Kids aren’t so different today. hahaha. I just made carrot salad this week. feeling nostalgic too I guess. 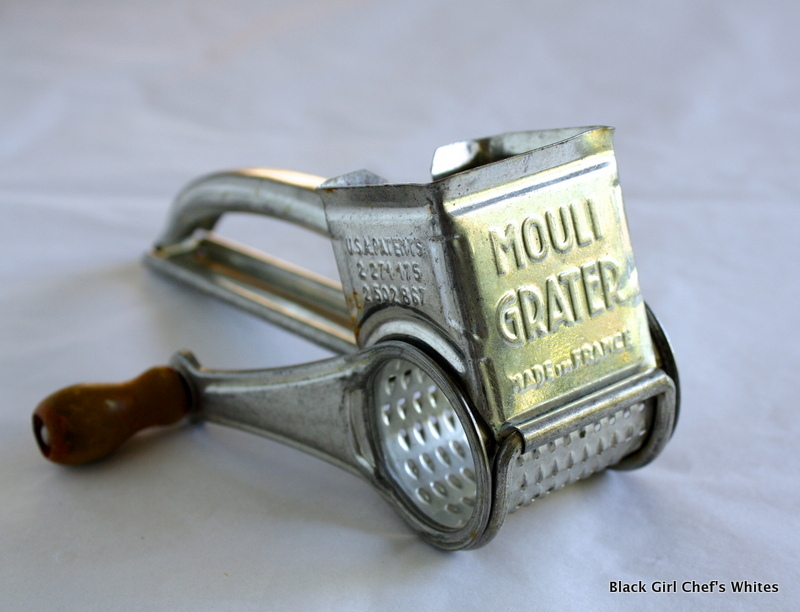 You were luck to have the Mouli….we had the stainless handheld. It’s lucky I still have knuckle skin. What a great post, your stories are beautiful. Happy birthday, Cheryl! Love your blog. I wait weekly to see your new post. I especially like this week. Nothing like family memories!